Select the account the money is leaving. 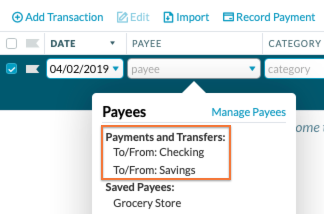 In the Payee field, your Payments and Transfers options are listed at the top. Select the account where the money is going. For linked accounts, transfers will import once they clear. If it's the first transfer between two particular accounts, YNAB won't know to make it a transfer, so it will import as a regular ol' transaction. Same goes for importing a file. Otherwise, you can make it a transfer by changing the payee. Then you'll see one side of the transfer in each account. If you had already imported the other side of the transfer (in the other account), it should match up and just need approval.